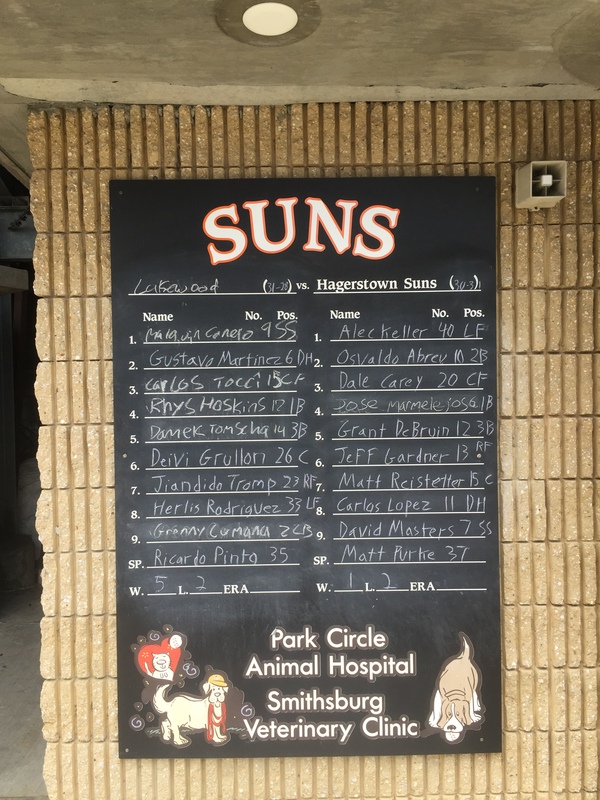 This week’s stop on the magical minor league mystery tour took me to Municipal Stadium in Hagerstown, MD, where the Hagerstown Suns were looking to exact revenge against the Lakeland Blue Claws after Saturday’s 9-1 loss. 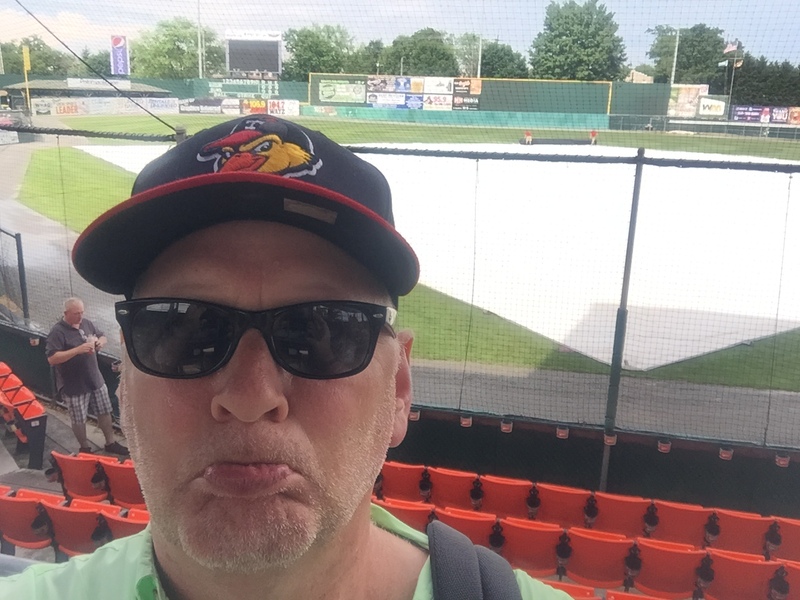 But the baseball gods felt it was a good day for rain, and after a rain delay of 1:05, the game was called and rescheduled as part of a twin bill Monday. Sadly, I will not be able to make tomorrow’s double header, but thank goodness for rain checks! The day was not a total waste as I was able to see this little historic park and it was a nice drive into rural Maryland. Municipal Stadium has been around since 1930, and is one of the oldest minor league parks still in use on a regular basis. 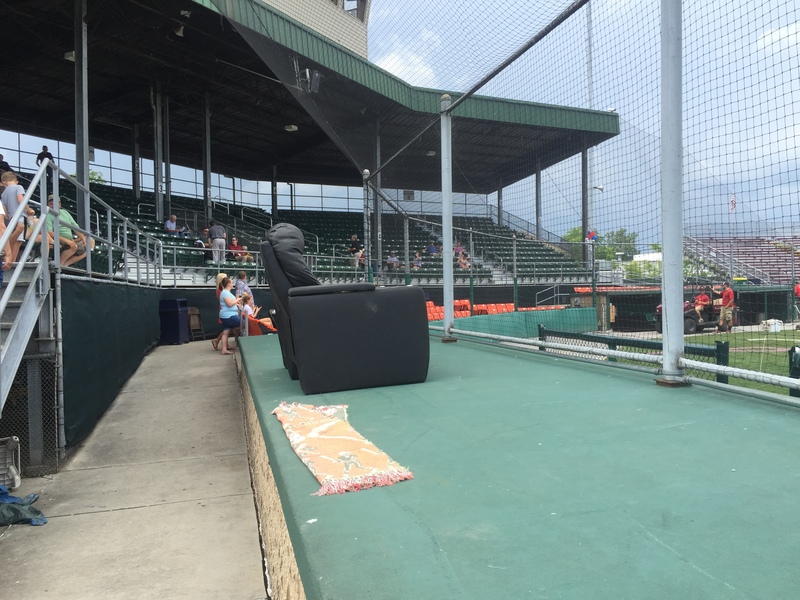 Depending on how you count, it’s either the third or fourth oldest minor league parks. 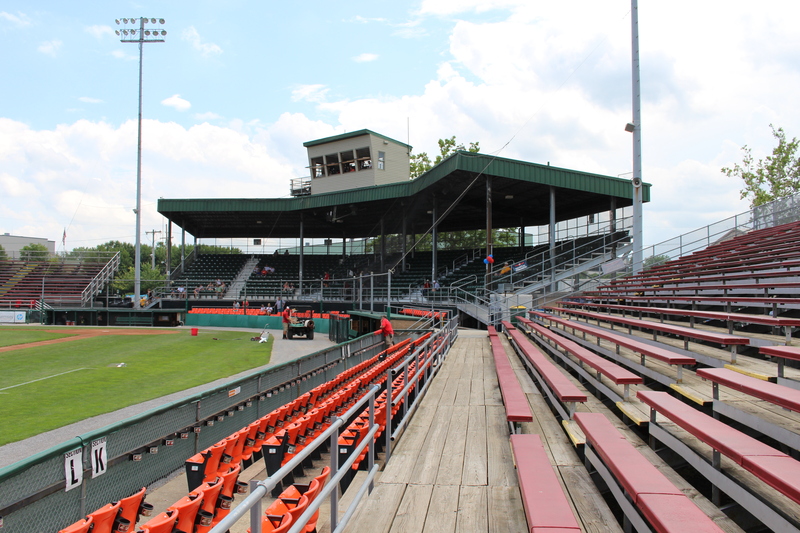 The only other parks that are older are Rickwood Field in Birmingham, Alabama (1910), Jackie Robinson Ballpark, aka “The Jack”, in Daytona Beach, FL (1914), and Susquehanna Bank Park at Historic Bowman Field in Williamsport, PA (1926). Rickwood Field no longer is the permanent home of the Birmingham Barons, however they do play one “throw back” game there every year. thi s little park does have is charm. Seats are very close to the field, and just two ticket levels – VIP “box seats” and general admission. And even the general admission seats under cover are not just bleacher seats, they are actual seats. Oh, and I guess a third level of seats that someone gets upgraded to, which are on top of the home team dugout! And although it didn’t come into play today, a hand operated scoreboard! 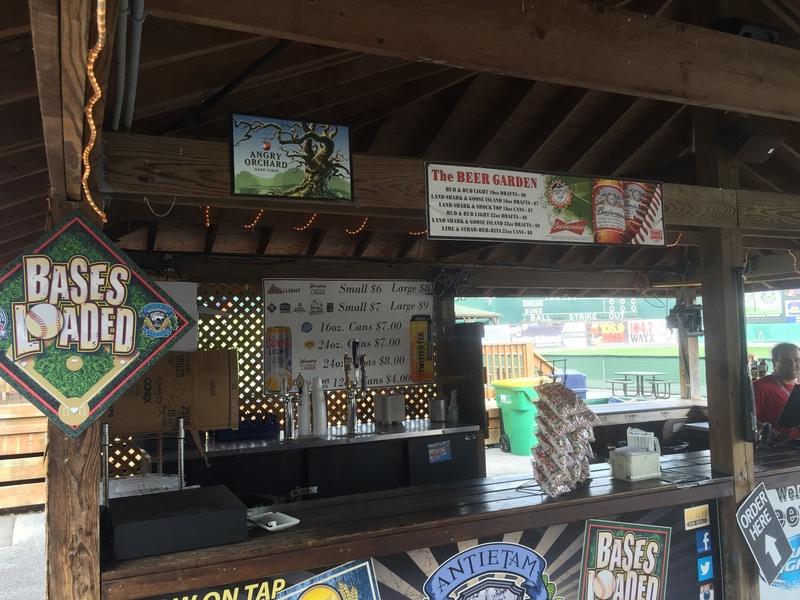 They also have a very nice beer garden that’s shaded, a welcome relief in the sun, and in today’s case, the rain! 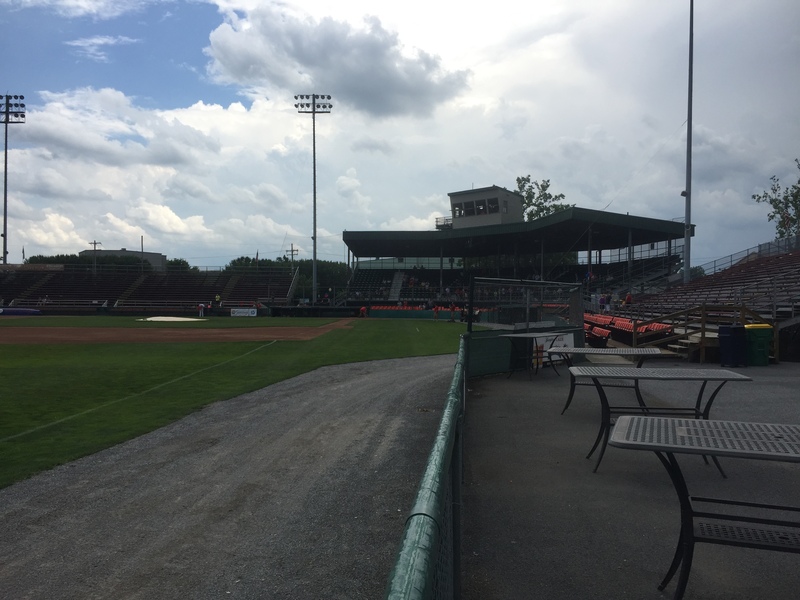 The first game played at Municipal Stadium saw the Hagerstown Hubs defeating the Frederick Warriors 14-6. The Hubs trace their roots back to 1915, and played their games in Willow Lane Park from 1915 to 1929 before moving to their new home. The old wooden grandstand was destroyed by arson in 1961 and rebuilt. While they could have gone bigger and newer, they kept it very old school. 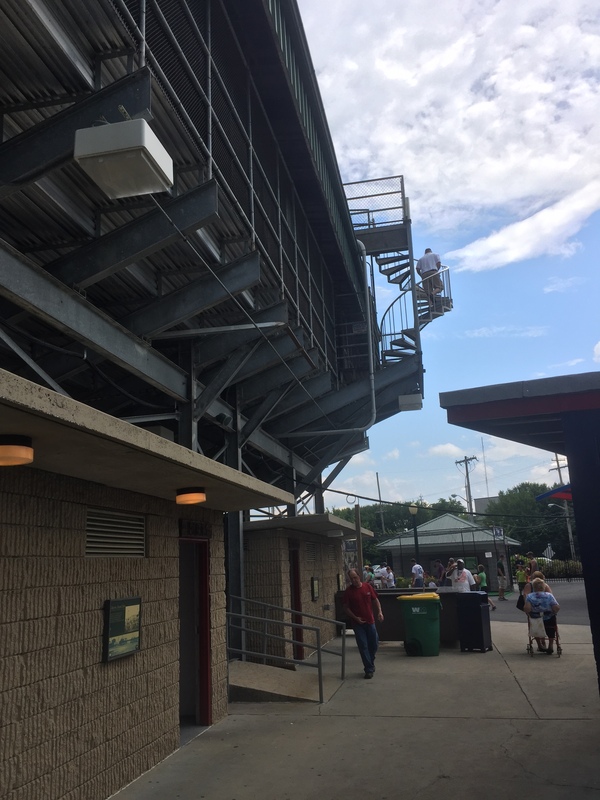 In fact, the press box sits atop the roof and is accessed by a circular staircase on the outside of the stadium. 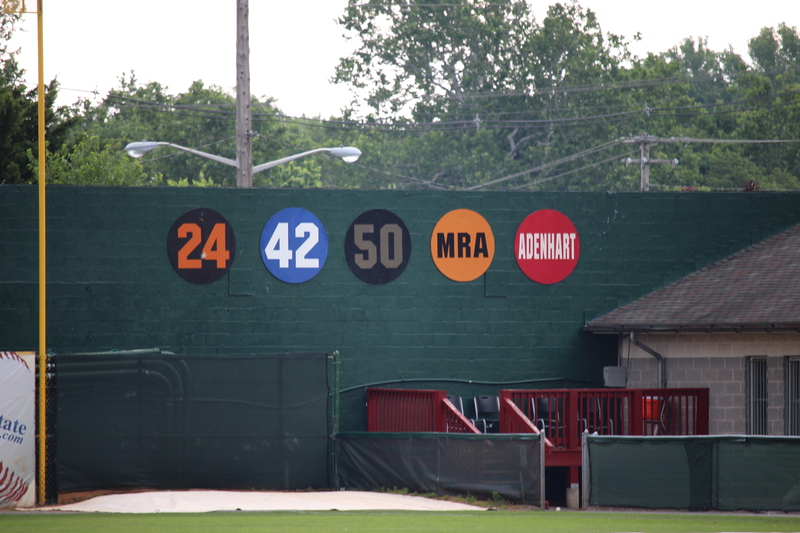 On the outfield wall they have a wall of fame honoring five individuals: 24 – Willie Mays; 42 – Jackie Robinson; 50 – John Henry Moss, who was the president of the South Atlantic League for 50 years; MRA – Mitchell Ronald Akers, a Hagerstown Suns employee who died in an accident at Municipal Stadium on April 11, 2012; and Adenhart – Honoring Nick Adenhart, a major league player from Washington County, Maryland where Hagerstown is located, who died on April 9, 2009 in a car accident. For you history buffs, Hagerstown traces its roots back to 1762 and was founded by Jonathan Hager. First named Elizabethtown, after his wife, it was changed to Hagerstown in 1813, and is the county seat of Washington County. Washington County, MD is the first county to be named after George Washington. And it bears more research but another interesting tie may be between Hagerstown and George H.W. Bush. President Bush attended a Suns game in 1990, and in 2008 his daughter Jenna married Henry Chase Hager. Could be a relation??? 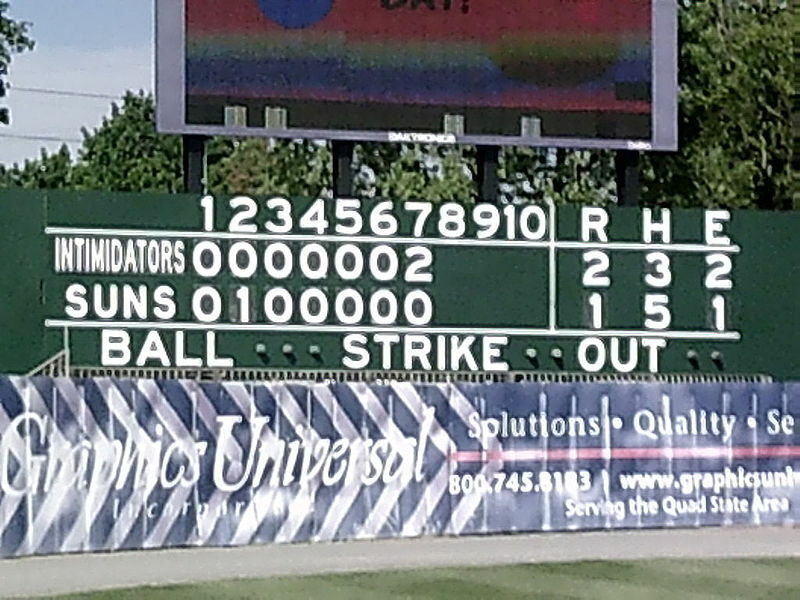 Although I didn’t get to see any baseball action, the trip to Municipal Stadium was well worth the trip and not a washout by any stretch. I can’t wait to cash in my rain check! Greg, very nice article. I get sad also when we have a rain out. Hopefully you can find your way back to our ballpark. Thanks for the great article. A little tidbit you probably didn’t know, this ballpark was constructed in just 90 days in 1930. Thank you Bob. I hope to make it back in a couple of weeks!